It is a good time of year to discuss water and exercise. Summer is usually the prime time of year for most of us to ride our horses. It is also the time of year when most competitions are held. While warm weather encourages us to spend extra time in the saddle, it also demands extra caution in caring for our horses and providing for their water needs. A lack of water will have a more profound and immediate impact on the well-being of the horse than a lack of any other nutrient. The body can lose nearly all of its fat and over half of its protein content and survive. A loss of just 1/10 of the body’s water can result in serious consequences. Supplying adequate water when it is needed can present some challenges for many horse owners. First off, how much water is required? A mature horse (about 1,100 lb.) requires 8–12 gallons (64–96 lb.) of water per day for maintenance. This would be on a cool day with low humidity. The amount required for maintenance is easily altered by the ambient temperature, relative humidity, type of feed, horse health and condition, or type of activity or production. For example, heavy training or competing in hot, humid weather may increase the maintenance requirement 300–400 percent. Moderate work or training may increase the water requirement 60–80 percent and hard work by as much as 200 percent. Feeding large amounts of dry feed (hay and/or grain) usually increases water needs. Conversely, horses grazing on lush, green pastures may meet most of their requirement from the water in the grass. Growing grass will contain 60–80 percent water. Highly digestible feeds may also decrease water intake. High-fat diets may decrease water requirements by lowering the heat load from digestion, commonly referred to as the heat of digestion or heat increment. High-protein diets or diets with a high salt content will increase the water intake. In addition to these dietary factors, exercise has a greatest influence on the amount of water required. Over 80 percent of the dietary energy metabolized results in heat production. Exercise increases the amount of heat the horse must dissipate in order to function. An inability to dissipate the heat load results in an increase in body temperature to a level that decreases performance and may endanger the horse. Without the ability to dissipate heat, moderate exercise (e.g., trotting) for a certain time, distance or speed would increase body temperature 0.6°F/minute while sprinting would increase it 1.2°F/minute. In either case, this heat production would increase the body temperature to a life-threatening 106°F in as little as 4–6 minutes. Fortunately, this is a very rare occurrence. The horse dissipates this heat load primarily through evaporative cooling. Sweating and the respiratory tract account for 55–60 percent and 25 percent of the evaporative cooling, respectively. Air movement helps with evaporative cooling. While the horse will still lose heat via evaporative cooling at ambient temperatures greater than body temperature, high humidity severely depresses the evaporative efficiency. The comfort index is the sum of the ambient temperature and the relative humidity. This is an indicator of the effectiveness of evaporative cooling. A value of less than 130 has no negative effect on cooling. Greater than 150, with the humidity contributing 50 percent of the total (RH over 75 percent), may compromise cooling efficiency. When the comfort index is over 150, there is a potential for overheating and extra caution should be observed. Values over 170 suggest minimal exertion should be asked of horses. And at values over 180 there is no heat loss, hence no forced exercise should be done. The ability to dissipate heat may also be decreased in horses that are in poor condition, have a heavy hair coat or are overly fat. These same conditions may also increase heat production, adding to a heat-loss problem. Slightly more than 1 quart of sweat will dissipate the amount of heat produced by trotting for 7–8 minutes. 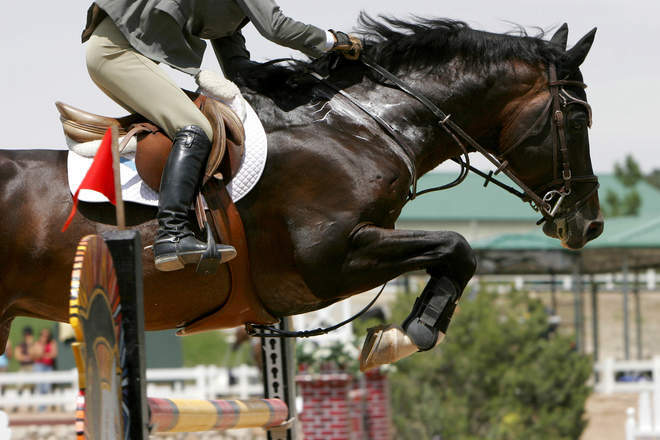 During intense exercise, horses can lose significant amounts of fluid as sweat. This is an important thermoregulation function during hot weather and exercise. Horses will usually sweat first in areas that cannot lose heat by radiation, such as under the tack and between the hind legs, followed by the neck, chest and flank. Sweat contains a protein with detergent like properties that enhances heat loss via evaporation. This is one reason wiping off sweat is counterproductive. Prolonged sweating results in a watery sweat that is not as effective in dissipating heat. Running cool water over the horse’s body is a great way to enhance cooling. Begin at the lower legs and work your way up and over the back, shoulder and neck. When using this method of cooling the horse, it may be better to not scrape away the water but let it evaporate. Although sweat plays a critical part in thermoregulation, it does have a downside. Sweat contains sodium (Na), chloride (Cl), potassium (K), calcium (Ca) and magnesium (Mg), collectively known as electrolytes. Horse sweat contains 3 times the Na and Cl and up to 10 times the K found in human sweat. This is one reason why electrolyte products designed for humans (e.g., Gatorade) are not great choices for horses. Excessive sweating and reduced water intake may quickly result in dehydration. As little as a 3–5 percent loss in fluid (2.5–5 gal.) can result in a reduction in performance. Signs of dehydration include a slow capillary refill time and a decrease in skin elasticity. Normal capillary refill time is 1.5–2.0 seconds. To measure the capillary refill time, press your finger on the horse’s gum (picture 1), remove it and determine how long it takes for color to return. A skin pinch, preferably done over the shoulder, should recede in less than 1 second. Although often used, the skin over the neck is not a good choice to use in checking skin elasticity since it tends to be looser and stand up more easily. Other signs of dehydration may include sunken eyes, lack of saliva, dry feces, decreased urination, increased hematocrit and increased plasma protein concentration. Decreased water intake coupled with excessive sweating may result in a decrease in performance at best or may result in a life-threatening situation. How do you minimize either of these situations? The gastrointestinal tract (GIT) is the only storage place for water or electrolytes. Excess water or electrolytes absorbed from the GIT are excreted in the urine. There is no way to stockpile extra water or electrolytes by providing them before exercise except the amount found in the GIT. Severe deficits can be prevented by replacing them as they are lost. This is why water, salt and electrolytes should always be available to the horse during hot conditions or during heavy exercise. An electrolyte product formulated for horses should always be used after exercise. If a quality electrolyte (e.g., AccuLytes™ electrolytes) is not available, a mixture of table salt and lite salt (equal parts NaCl and KCl) may be used. It is preferable to give 2 oz. every 2–3 hours during and after work, as long as water is available. Giving additional electrolytes for 1–2 days after strenuous work may be beneficial. Sufficient high-quality hay, an excellent source of K, and free-choice salt should be available even with the use of electrolytes. It cannot be overemphasized that sufficient water should be supplied anytime you give electrolytes. Electrolytes are a good means to encourage water intake by your horse. Salt blocks are not recommended because of the difficulty for the horse to readily get enough salt from such a hard substance. During exercise, allowing the horse to drink as often as possible is recommended. Cool water is preferred because it results in the stomach emptying faster. This can help get the electrolytes to the site of absorption in the GIT. After exercise, hot horses should be cooled before allowing free access to water. Provide free access to water. Ensure the water is palatable. Automatic waterers must be checked. If you are concerned about intake, use a bucket. A flowmeter may be added to the water line of an automatic waterer. Clean buckets and troughs regularly. Understand the relationship between the type of feed and water intake. Horses kept on a lush pasture will probably drink less water than those fed hay. Provide salt in a loose form to encourage adequate water consumption and help maintain electrolyte balance — 1–2 oz. per day or free choice if the horse is pastured. Free-choice salt for horses that spend most of their time in a stall usually results in overconsumption of salt and increased water intake and urinary output. This may result in an increase in bedding cost. Use an electrolyte during warm weather. Gels or pastes are excellent means to carry an electrolyte with you on the trail or when away from the trailer or barn. A small tube of electrolytes (30 cc or 30 g) may not contain enough salts to replace those lost in sweat (2 oz. or about 56 g). A powder electrolyte is a good choice to use when adding electrolytes to the feed. In either case, sodium chloride (salt) or potassium, usually potassium chloride, should be in the first 4 ingredients. Calcium and magnesium, along with small amount of iron, copper, zinc, manganese and sometimes cobalt may also be supplied in the product. A small amount of sugar may be beneficial in decreasing the absorption time. Do not add electrolytes to water. This usually results in a decrease in water intake due to saltiness in the water. Although, in some horses accustomed to drinking water containing electrolytes this procedure may be fine. Monitor the hydration status of your horse. Know the normal temperature, pulse, respiration, capillary refill time, etc. of your horse(s). Remember each horse is an individual. Use running water to cool your horse during hot weather, especially if the sweat is thin or watery. Supplying sufficient water, judicious use of electrolytes and using common sense during hot weather will maximize the performance of your horse while ensuring his safety. AccuLytes is a trademark of Farnam Companies, Inc.